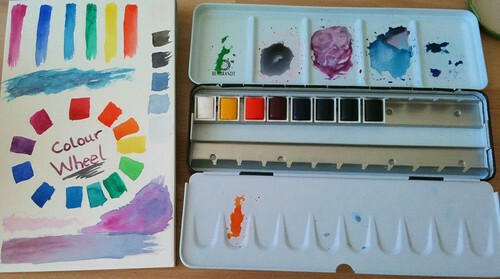 Today I went for a little ride on my bicycle and bought myself a set of watercolour paints. This is my first "real" set ever! I didn't even have a "student" set before; I was still using my childhood watercolour set. I decided to go with a limited palette to start out. Hopefully this will help me learn a lot about mixing and not just drive me crazy. Rather than buy a pre-packaged set, I picked out 8 colours, which I will probably expand once I see where I'd like more range or convenience to avoid mixing. My box can fit up to 24 pans. I went with pans since I think they're easier to manage than tubes. The colours I have are: Chinese white, benzimidazolone yellow, pyrrole orange, quinacridone magenta, ultramarine blue, pthalo blue (GS), pthalo green (BS), and ivory black. I found the information on this excellent website very helpful in picking out a basic palette. On one planet, it rained paisley. How to De-Clutter and minimize your "Stuff"